There are many way to travel from Bali to Lombok. We can reach Lombok from Bali only in a hour to day because many domestic flights offering transfer between Bali and Lombok. The new updating travel info to get Lombok from Bali is by fast boat. About 10 fast boat operators service fast sea transfer to Lombok from all area in Bali, including free pick up and drop service. 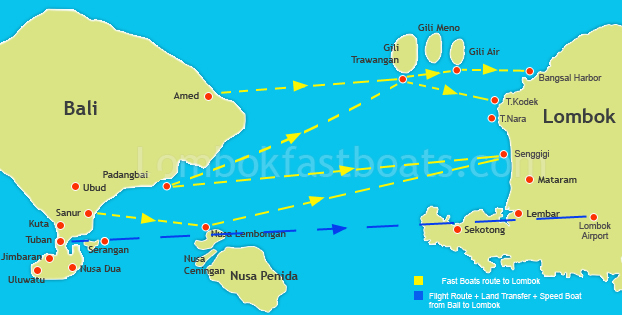 The fast boats are departed through 5 ports in Bali, they are Padangbai, Sanur, Serangan, Benoa and Amed. Fast boat transfer to Lombok recommended for the people who will visit Gili Island, North of Lombok and West Lombok (around Ampenan, Mataram and Senggigi area). Going from Bali to Lombok or return is more easy today because many fast boats offer direct transfer. Lombok is one of the two main islands of province of West Nusa Tenggara(NTB), can be reach from Bali around 1.5 hours via Padangbai harbor and 2.5 hours via Sanur or Serangan harbor. You can choose any of fast boats, Schedule, Ticket Price and Departure point through lombok fast boat or click the links of direct fast boat from Bali to Lombok, Marina Srikandi, Wahana Gili Ocean and Mahi-Mahi Dewata. The cheapest way to reach Lombok is by ferry. We will spend about IDR 35.000/Person today. As the cheapest way to Lombok but spend more times on the sea, about 4-5 hours. This transfer is recommended for backpacker holiday. We can buy the ticket direct to the harbor, Padangbai in Bali and Lembar in Lombok. As the note: we will spend more cost for the land transfer to/from harbor.